A mountain range is a series of mountains that are connected together generally to form a long line of mountains. Large mountain ranges may be made up of smaller mountain ranges called subranges. For example, the Smokey Mountain Range is part of the Appalachian Mountain Range. It is a subrange of the Appalachians. Below is a list and description of some of the world's great mountain ranges. The tallest mountain range in the world is the Himalayas and the longest is the Andes. The Himalayas stretch 1,491 miles through much of central Asia. They travel from Afghanistan and Pakistan through India, Nepal, and China all the way to Bhutan. The Himalayas also include the formidable Karakoram and Hindu Kush mountain ranges. The Himalayas are most famous for their tall peaks. The majority of the worlds tallest mountains are in the Himalayas including the two tallest moutains: Mount Everest at 29,035 feet and K2 at 28,251 feet. The Himalayas have played an important role in the history of Asia. The mountains in Tibet and the high peaks are considered sacred in many religions including Buddhism and Hinduism. At around 4,300 miles long, the Andes Mountains make up the world's longest mountain range. The Andes stretch north to south through much of South America including such countries as Argentina, Chile, Peru, Bolivia, Venezuela, Colombia, and Ecuador. The highest peak in the Andes is Mount Aconcagua which rises to 22,841 feet. The Andes played a vital role in the history of South America. 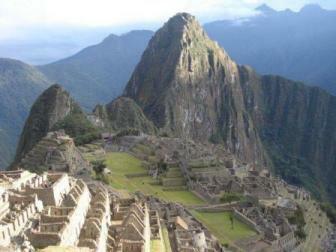 The Inca built their famous ancient city, Machu Picchu high in the Andes. The Alps are a major mountain range in central Europe. They pass through many European countries including France, Germany, Switzerland, Italy, Austria, and Slovenia. The tallest peak in the Alps is Mont Blanc at 15,782 feet located on the French-Italian border. The Alps took their place in history over the years. Perhaps one of the most famous events was when Hannibal from Carthage crossed the Alps during the Punic Wars to attack Rome. The Rocky Mountains Range from north to south in western North America. They run from Canada to the US state of New Mexico. The highest peak in the Rockies is Mount Elbert which is 14,440 feet tall. The Sierra Nevada Mountain Range runs somewhat parallel to the Rockies, but further west in the United States. Beautiful national parks are located here including Yosemite and Kings Canyon. The tallest mountain in the contiguous United States, Mount Whitney at 14,505 feet is part of the Sierra Nevada. The Appalachian Mountains run parallel to the Atlantic Ocean coastline on the eastern part of the United States. The Ural Mountains run north to south in western Russia. The eastern side of these mountains is often considered the boundary line or border between the continents of Europe and Asia. Other important world mountain ranges include the Pyrenees, Tian Shan, Transantarctic Mountains, Atlas, and the Carpathians.